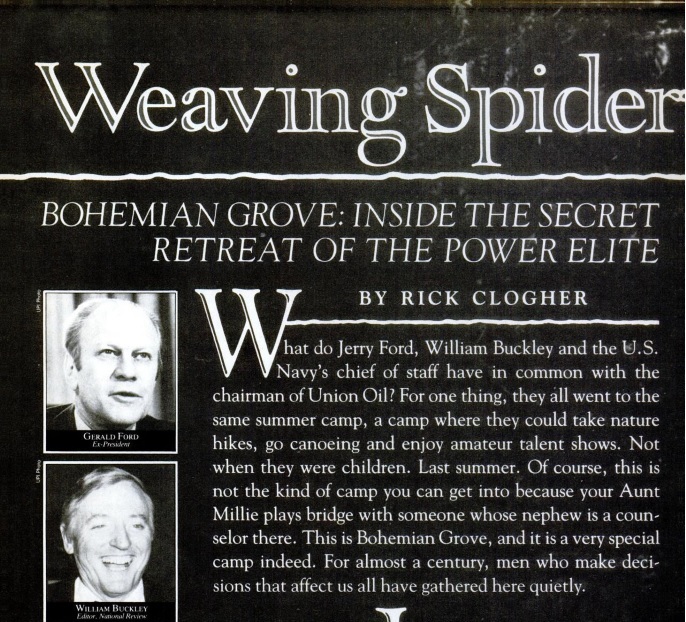 Since The Bohemian Grove Action Network (BGAN) started it’s work some 30 + years ago, it’s been successful in focusing some national media attention on this place, a place where the elite decision makers shed their pretenses, engage in all sorts of unbridled truth telling (to each other), and perhaps more importantly, as the articles we link to below demonstrate, NETWORKING. Engaging in some decidedly “unchristian” shenanigans, they let their hair down and show who, and what, they really are, and more importantly, what they, via their “Lakeside Talks, want for the world. How is what they do and say at the Bohemian Grove relevant here, and now, and ever? And why should I care? Some insight is provided below. A good start is a link to subject matter of past “Lakeside Talks” BGAN has exposed. Their motto, “Weaving Spiders, Come not here.” doesn’t quite ring true somehow, when you know just a little bit about them. Below is a list of links to articles inspired by the Bohemian Grove Action Project and other activists. This is the cover graphic to a story we inspired Mother Jones to write in August of 1987. The Bohemian grove story starts on page 28. What can we say? Read it and weep. 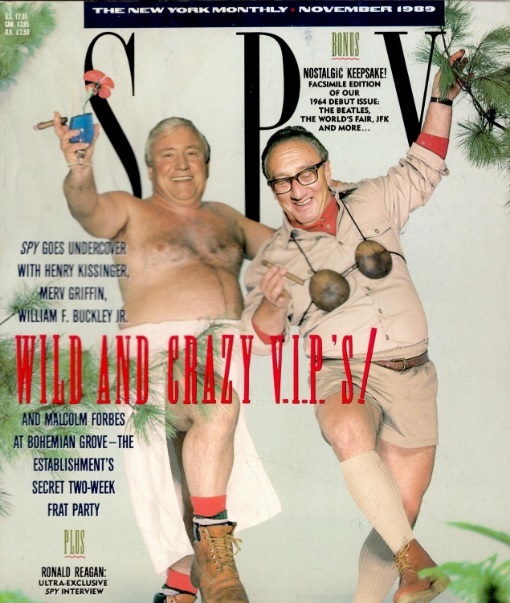 Merv Griffin and Henry Kissinger. Boys will be boys, harmless? 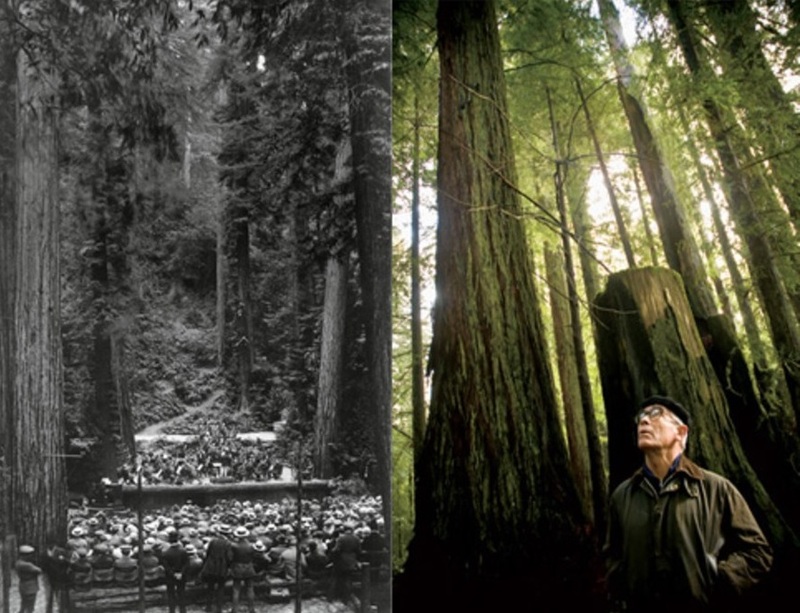 BGAN’s first protest in 1980 uncovered more than was made apparent by sociologist G. William Domhoff’s 1974 “The Bohemian Grove and other Retreats”, which helped spark the protest. During the two week encampment, protesters vigiled 24 hours a day at the front gate; members passing by on foot sometimes stopped to talk, very open about their faith in the “Invisible Hand of the Marketplace”, thrilled by presidential candidate Ronald Reagan, a fellow Grover, and his promise to release industry at long last from profit taking regulation.